*Disclaimer: Designer Whey provided these products to me. I was not compensated for this review, expect for my time. As always, all thoughts and opinions are my own. 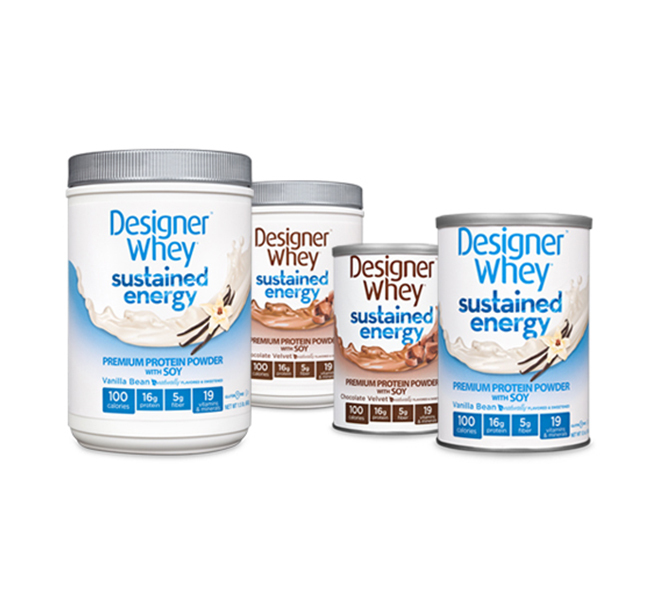 I'm a huge fan of Designer Whey products. I use their Protein Powder and Protein2Go packs all the time (great tasting and convenient). I recently had the opportunitity to try out their new product - Sustained Energy Protein Powder. DW sent me the Vanilla Bean and the Chocolate Velvet flavors to try. Over the course of about 8 days, I used their Sustained Energy Product (instead of their Protein Powder) in a variety of ways: morning smoothies, afternoon smoothies, post run pancakes and on-the-go protein drink. The Sustained Energy formula provides more endurance and sustained energy because of the proprietary Endurance Blend™, a combo of "fast absorbing whey protein and slower absorbing soy and casein proteins, giving you a steady supply of essential amino acids while helping you control hunger with fiber" (via http://designerwhey.com/products/powders/sustained-energy/). One scoop of either flavor provides 16 grams of protein, 5 grams of fiber and 19 essential vitamins and minerals and is only 100 calories. Want to try Designer Whey Sustained Energy? The good folks at Designer Whey are giving me 6 cannisters of the Sustained Energy protein. That means, 6 of you will win! This is open to US residents only and the winners can choose to try out vanilla or chocolate. Tweet about the giveaway: "Enter to win FREE Designer Whey product from @hotbirdrunning: http://bit.ly/17t8EKq"